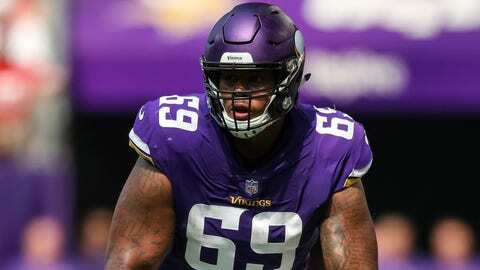 After two weeks on the bench, offensive lineman Rashod Hill was pressed back into service for the Minnesota Vikings. Hill played 23 snaps Sunday in the Vikings’ win over the Green Bay Packers, subbing in at right tackle while rookie Brian O’Neill was evaluated for a concussion. O’Neill returned, ultimately missing 17 plays, while Hill also filled in briefly for Riley Reiff at left tackle, who missed four plays. It was Hill’s his first significant action since Week 8, when he was on the field for all 73 offensive plays against the New Orleans Saints. Now in his third season with the Vikings, Hill has started eight games this season and appeared in 11. He was flagged for a false start on the second-to-last play of the first half Sunday. Kicker Dan Bailey missed the ensuing 56-yard field-goal attempt. — Linebacker Anthony Barr returned after missing three games with a hamstring injury, appearing on all 53 of the Vikings’ defensive plays. — Second-year linebacker Eric Wilson, who started in Barr’s absence, played just three snaps on defense. — Wide receiver Laquon Treadwell continues to play significant snaps, but was used sparingly. Treadwell was on the field for 47 percent of the Vikings’ plays on offense, but was targeted just three times. — Aldrick Robinson continues to gain on Treadwell. The veteran was targeted twice, hauling in one catch for 11 yards, but was on the field for 26 percent of the Vikings’ plays on offense, up from just 12 percent last week. — Running back Ameer Abdullah played two snaps on offense and was targeted once in the passing game in his second game with the Vikings.